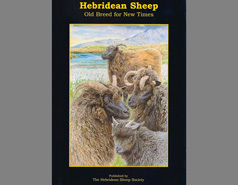 These technical papers are reproduced from the Hebridean Sheep Society's magazine, The Black Sheep, and from presentations at the various symposiums and meetings. The paper, Four Horns, Split Eyelids, by Eric Medway explores the inheritance of four (multiple) horns by comparing two hypotheses. Put simply, one states that the allele for four horns is dominant, while the other suggests it is recessive! This paper, Black Sheep Go Green! by David Braithwaite and Eric Medway, combines a summary of the survey of member flocks about environmental management and extracts from the paper presented by David Braithwaite at the 4th World Congress on Coloured Sheep. 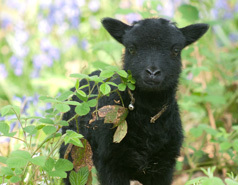 The technical paper Hebridean Colour Genetics, is an adaption of a paper presented by Jon Parfitt and Andrew Sheppy at the 4th World Congress on Coloured Sheep held at York in July 1994, and explores the occasional occurrence of white sheep within their flocks. ‘Silvering’ in Fleeces - The Explanation? This technical paper, Silvering” in Fleeces - The Explanation?, tackles a problem that Eric Medway took to Dr Stuart Telfer at the Department of Animal Physiology & Nutrition at Leeds University who had a particular interest in mineral nutrition and had recently been responsible for the re-launch of the Cosecure bullet which provides Cobalt, Selenium and Copper supplementation. 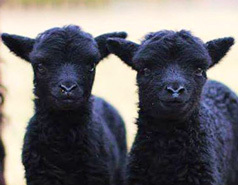 This technical paper on the Protocol for Test Mating for Absence of Dominant Black Allele, is based on the fact that Hebridean sheep are black because they are homozygous recessive for a black allele at one of the two loci for colour genes in sheep - the A locus, however some Hebrideans produce white lambs when bred with other, normal Hebridean sheep which do not carry this dominant allele.